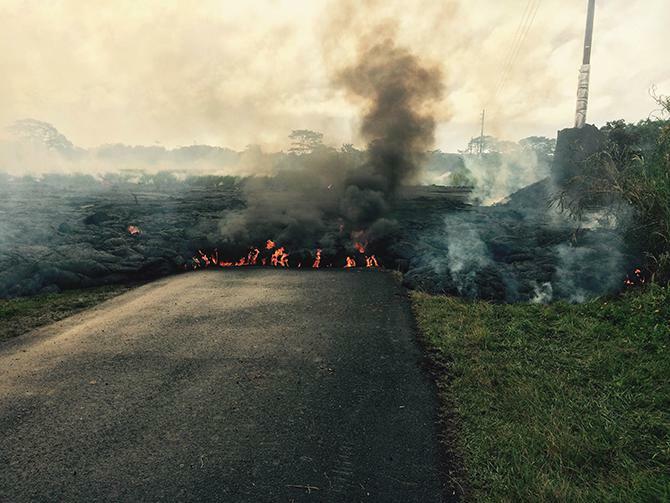 Lava inching its way toward the town of Pahoa on Hawaii’s Big Island. What do you do when an unstoppable, 2,000-degree plume of lava is inching toward your town? Walk for your life—quickly. 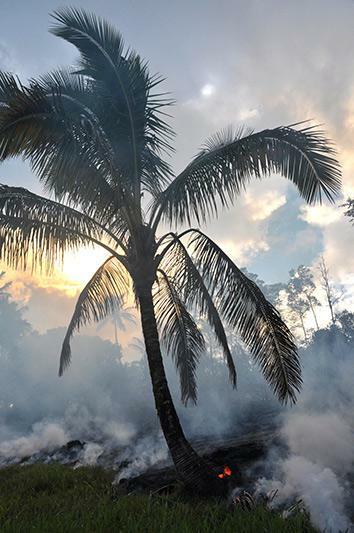 That’s what’s happening on the Big Island of Hawaii this week, as residents of Pahoa calmly come to terms with the fact that their town will soon be changed forever by a neighboring volcano. It appears the first structure has already been claimed, as of early Tuesday morning, Hawaii time. According to Hawaii County Civil Defense, local residents have been placed on an evacuation advisory as of Monday evening, and roads are closed (in anticipation of them being engulfed as well). In the last few days, as it approached Pahoa, the lava engulfed a cemetery with markers dating back to 1905, the final resting place of dozens of first-generation Japanese immigrants who came to Hawaii as plantation workers. Hawaii Public Radio has a moving segment about local residents making peace with the fact that they’ll never be able to visit the graves there again. According to a Tuesday morning (Hawaii time) update, the lava flow was advancing at an average rate of about 5 yards per hour. The town of Pahoa itself, population 945, could be largely cut off from the rest of the Big Island as early as Wednesday, when the lava should overtake the main road. 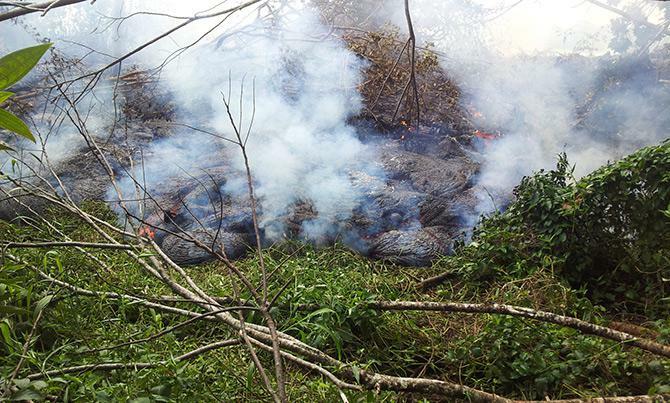 Thousands more people live further downhill of Pahoa, should the lava make it that far over the coming days. Normally, lava from Kilauea takes a short path southward, where it ends up quickly crystalizing in seawater. 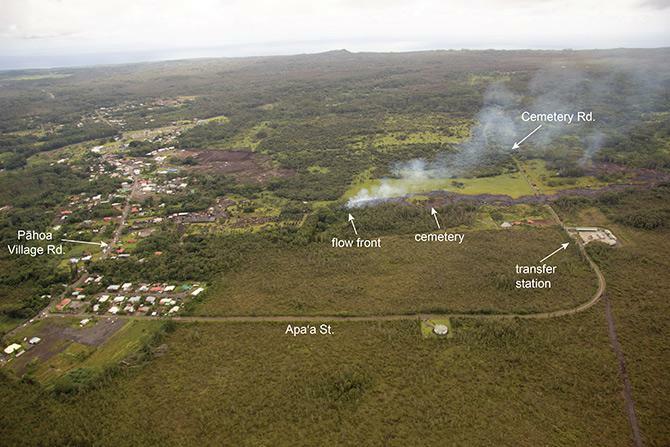 On June 27 of this year, however, a new plume turned toward the north and has been encroaching on the town of Pahoa ever since. 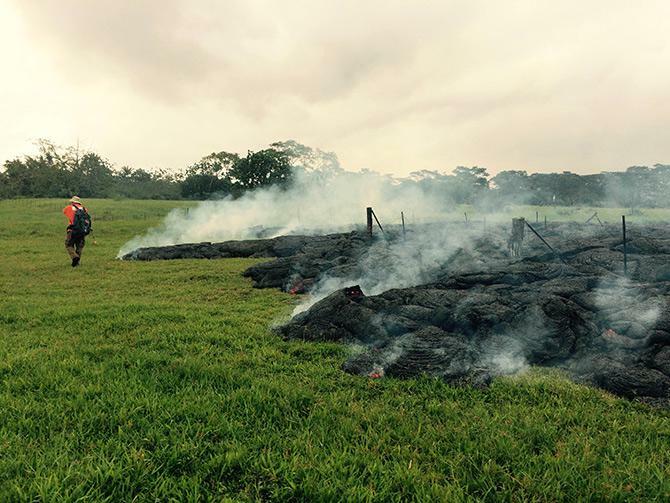 This weekend, the lava engulfed a pasture on the edge of town. 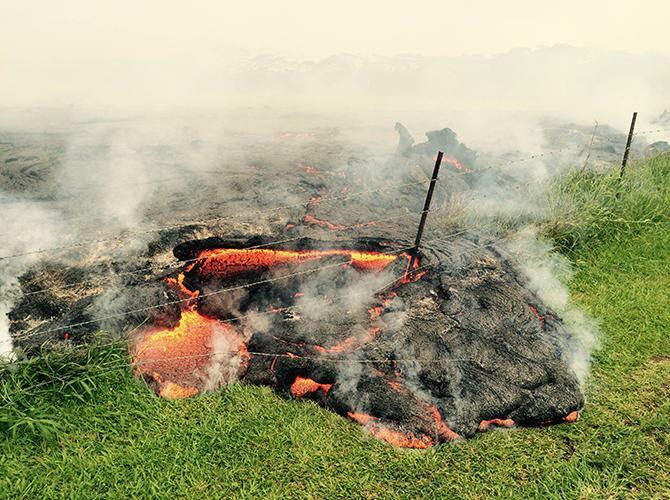 As it advances, the lava crackles and pops as it burns vegetation. This weekend, the lava buried a century-old cemetery with graves of first-generation Hawaiian immigrants. 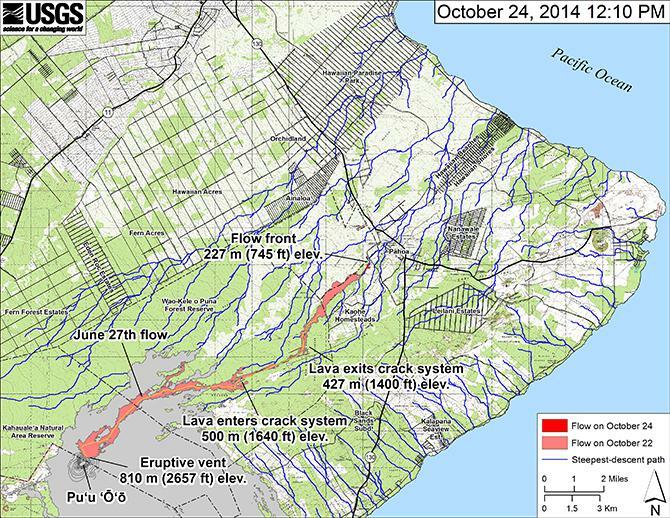 USGS geologists continually monitor the lava and track its forward progress. 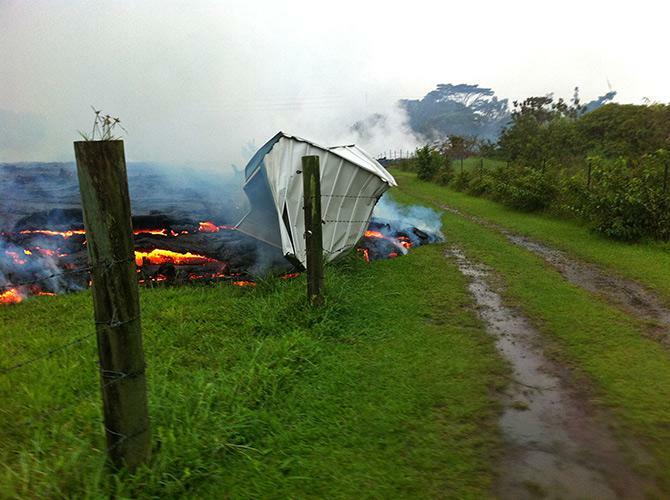 On Saturday, the lava burned this shed. On Sunday, the lava burned this palm tree. 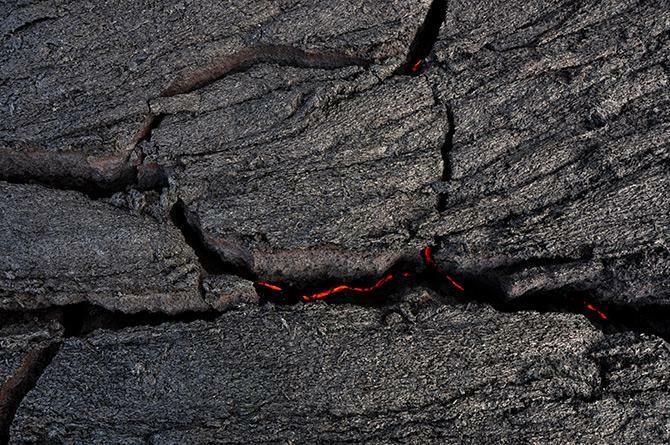 The lava flow is driven by a continual supply of molten rock just beneath the black crust, which rises and cracks as it is driven upward from below. As of Monday, the lava was just a few football field lengths away from the center of town, a distance it was expected to cover in a day or so. 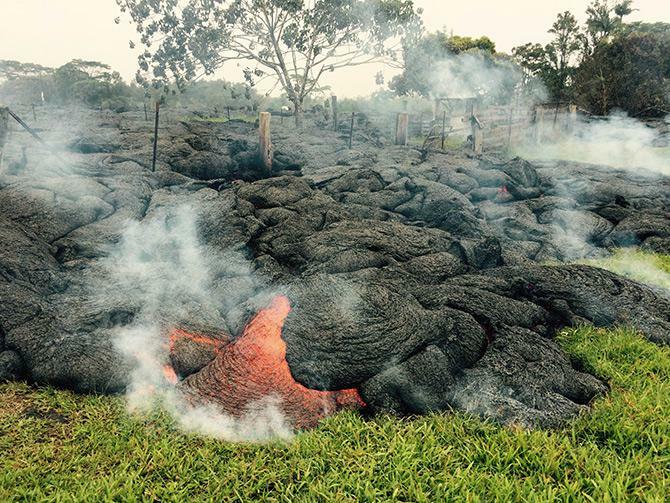 An aerial thermal image showed the lava’s heat as it neared the town of Pahoa. A map from the USGS shows the lava plume from its source at the Pu’u ‘O’o vent of the Kilauea volcano, about 12 miles away.